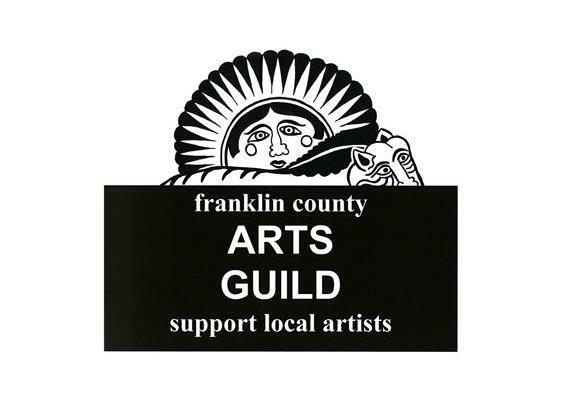 The Franklin County Arts Guild is an organization of local artists and friends who are interested in promoting the visual and performing arts in Franklin County. The Guild works to promote and provide art education and awareness for all ages. The Franklin County Arts Guild also provides a scholarship for a promising high school senior planning to study art or art education at the university level. The Arts Guild provides artists an opportunity to exhibit and sell their works through the The Artisan Depot Gallery & Gift Shop, 204 E. Cumberland Street Cowan, TN. Guild members and other local artists sell work there. The Franklin County Arts Guild actively promotes the arts within the community. The Guild, along with the Kiwanis Club, sponsors the annual Student Art Show. Local art teachers send their students’ best work to be judged. FCAG has worked with several grants for with art at the core. One important 2-year project was an after school program for at-risk middle schoolers. Currently the Guild is hosting Community Art Shows at the Artisan Depot. Each show is themed and any artists can put work in the show. Membership or fees are not required. There are six shows each year with artists of all ages participating. Through its various activites and events the FCAG offers an opportunity to make new friends in the community and to share in the wealth of information and support afforded by its members. We are always open to new members and you don’t have to be an artist to join! Our meetings are held on the fourth Tuesday of the month at 7:00 pm. We usually meet at the Cowan Art Center/Education Training Building, 303 Montgomery Street, Cowan, TN. Call Diana Lamb at 931-308-4130 for more info or stop by the Artisan Depot to sign up. The gallery is open Thursdays, Fridays & Sundays from 12-5pm and Saturdays 11-5 pm. You can also sign up by clicking on the Join the Guild, It’s Easy! box at the top of this page, print the form & mail to us. New members are always welcome & our meetings are open to the public. 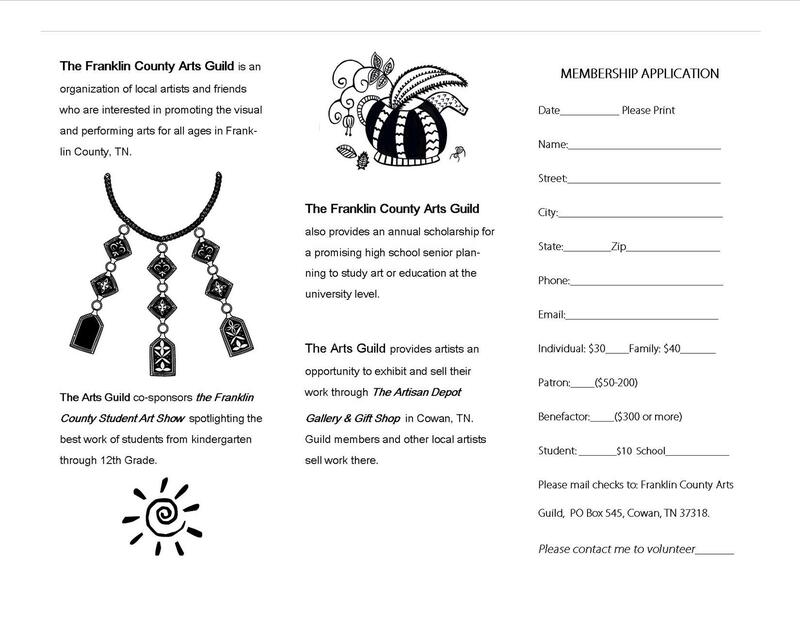 Two ways to join the Franklin County Arts Guild: (1) Print this form & mail to the PO Box address (on form) or (2) Stop by the Artisan Depot Gallery, 204 E. Cumberland St., Cowan, TN. Have some questions? Call Diana Lamb at 931-308-4130 or email us at fcartsguild@gmail.com. Find & Like us on Facebook at http://www.facebook.com/franklincountyartsguild or www.facebook.com/artisandepot Click on form to enlarge size to print. Can you tell me what kind of music will be on tap for the Acoustic Jam on March 29, 2012?